There are currently no Richlands Richlands, VA notable alumni listed. Be the first to add an RHS famous alumni. The memorials below are for students of Richlands High School that have passed away. There are currently no memorials for Richlands Richlands, VA alumni. 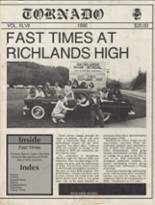 Alumni from RHS can use this site to get in touch with old friends from their high school in VA.	Richlands High School alumni can relive their experiences from high school by sharing memories and pictures, reconnecting with those alumni listed, and more. If you are a former student of Richlands High in Richlands, Virginia, register now to add your name. Eric Rasnake has someone searching for them. Whitney Brown has someone searching for them. Jeff States registered as a RHS alumni. Jeff States updated their profile picture. Jeff States added photos to their personal photo gallery. Jim E Lambert registered as a RHS Class of 1971 alumni. Jim E Lambert updated his profile picture. Jim E Lambert added photos to their personal photo gallery. Jim E Lambert requested a RHS yearbook from 1967. Michael Farris added photos to their personal photo gallery. Michael Farris registered as a RHS Class of 1967 alumni. Michael Farris updated his profile picture. Linda Stuart Cordle updated her profile picture. Linda Stuart Cordle added photos to their personal photo gallery. Linda Stuart Cordle registered as a RHS Class of 1978 alumni. Linda Stuart Cordle requested a RHS yearbook from 1978. Steven Shinall registered as a RHS Class of 1971 alumni. Steven Shinall updated their profile picture. Steven Shinall added photos to their personal photo gallery. Steven Shinall requested a RHS yearbook from 1970. Tamara Wilson registered as a RHS alumni. Tamara Wilson updated her profile picture. Tamara Wilson added photos to their personal photo gallery.